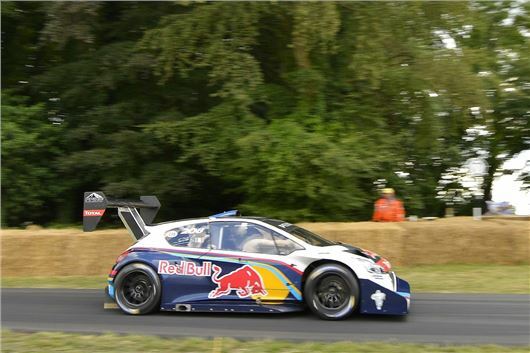 With a time of 44.6 seconds, Sebastien Loeb was quickest up the hill in his Pikes Peak Peugeot 208 T16 at the Goodwood Festival of Speed Sunday Shoot Out. This was despite short gearing that meant he was hitting the rev limiter by the bridge opposite the house and on the final straight, limiting his maximum speed to 145mph. Watched by more than 3,000 people on a delayed 'live stream' (and thousands more live on Sky TV) he beat Michael Bartels Maserati MC12 with a time of 45.82, Kenny Brack's McLaren F1 GTR 'Long Tail' at 47.52 and rising star, 23 year old Jann Mardenborough from Darlington in a Nissan GT-R NISMO GT3 with a time of 48.05. The record remains held by Nick Heidfeld with a time of 41.6 seconds set in a McLaren MP4/13 in 1999. Since then, current F1 cars have been excluded and Justin Law holds the record for the fastest non F1 car of 44.19 seconds in a Jaguar XJR8/9 in 2008.